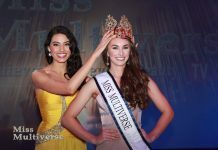 A competition for Mrs. Multiverse was held in the Dominican Republic. The sexiest married women in the world participate in the competition. The winner this year was Aselina Kucukova, from Kazakhstan. The first-runner was Croat Maja Govic Curavic. Maja is a mother to a seven-year-old girl and is a math teacher. When she does not teach, Maja holds trainings in aerobics. The third was Romania’s Delia Duka.